I love a home makeover show. It’s fun to see what the designers will come up with and decide if it’s going to have a positive or negative impact on the energy of the space. After having spent so much time indoors over the winter, the idea of a spring makeover is very appealing. 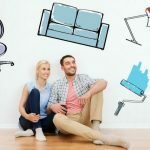 Here are some simple ways to give your home a makeover and improve it’s energy with very little financial outlay. The move towards much flatter paint finishes means that areas of the home that don’t get direct light can be quite dark and shadowy. Full spectrum daylight bulbs mimic the effect of normal daylight so if you want to create the effect of having an extra window, this is just the way to do it. You can also try adding a new lamp placed in front of a mirror or use a chandelier to get the light reflecting around the space. Feng Shui benefit: Fresh energy is damaged by dark spaces so you will immediately start to benefit from stronger “chi”. Not only will your home feel better, but you can expect to experience a boost in other areas of your life too. When we decorate, we are often inspired by the colour trends of that time. If you’ve done any decorating in the last few years, the chances are that you will have some shade of grey within your home somewhere! Changing a room colour involves a degree of upheaval that few of us relish but you can change the energy of your space by changing any large expanse of colour. Usually its walls, ceiling or floors that count. If you don’t fancy decorating, perhaps you could add a rug of a different colour. This is an easier way to bring in a “pop” of colour with less effort than it would take to spend the weekend decorating. Just as easily, you could introduce a large-scale colourful artwork or print on the wall or add some brighter throws to the sofas. Feng Shui Benefit: Colours are used to balance the energy of a space in Feng Shui. By adding a different colour you are changing the dynamic in that room. I love houseplants but have to confess that after a while, I stop noticing the ones I have. Introducing more plants to a room (or even moving around the ones you have) will change the energy of a space. Maybe you’ve had a plant sitting in a corner of the living room years and you no longer notice it. Moving it to another room in the house will give that space a boost of energy, while also gaining you extra space in the living room. At this time of year, spring bulbs and flowers are really cheap. Introducing these into the house is a good way of reminding yourself that there will be better weather coming soon! Make sure that the doorway to the room isn’t blocked by furniture. Make it easy to walk through the room. Not only is it irritating to have to navigate furniture but it stops the energy flowing too. Get rid of anything you no longer use. The more space you have, the more room there is for good energy to enter. Always try to have an attractive or restful “view” when you are trying to relax. You don’t want to look at piles of paperwork or out of a window at a boring fence. Feng Shui Benefit: Allowing energy into a room and letting it flow helps create a comfortable space. Being able to relax in your home promotes a feeling of well-being. The position of the bed can be a deeply entrenched habit but this option is worth a try if you find that you don’t sleep well or you have very vivid dreams. Try moving the head of your bed to another solid wall, out of line with the door. This might feel like a hassle to do but it’s worth remembering that a good night’s sleep makes a huge difference to our health and well-being. So for the cost of some full spectrum daylight light bulbs, some paint and a few additional plants, you can give the chi of your home a boost!